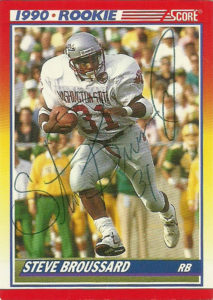 Cards: ProSet 1990, ProSet 1991 CPotY, Score Supplemental 1990, GameDay 1992, Action Packed 1991. Barry Word was a surprising comeback story. Out of football for over a year and working for a telephone company in Virginia, Word was called up by the Chiefs to attend camp in 1990. 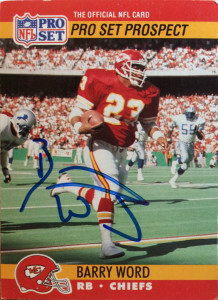 He not only made the squad, Word made a potent one two punch with Christian Okoye. 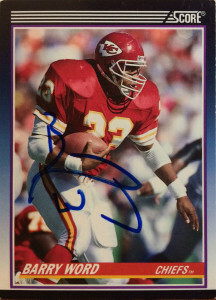 Possessing a similar downhill running style to the Nigerian Nightmare, Barry had 204 carries for 1015 yards and 4 TDs- netting himself NFL Comeback Player of the Year Honors. 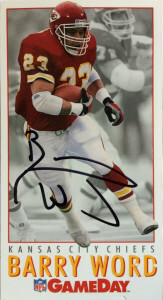 Barry was originally a 3rd round pick by the New Orleans Saints out of Virginia in 1985. Over his 4 year career for the Cavaliers, Word rushed 405 times for 2257 yards, and 17 TDs. The problem is that Barry tested positive for Marijuana at the combine. The Saints didn’t have a problem with that. They had a problem with the conspiracy to distribute cocaine that he got busted for. 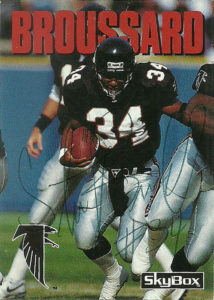 The Saints let him go, but retained his rights, while Barry bode his time in prison. Word returned to the Saints in 1987. He suited up for 12 games, and started 1 contest rushing 36 times for 133 yards and 2 TDs. The Saints were knee deep at runningback however, and in 1988, Barry just suited up for only 2 games. He’d spend the entire 1989 season out of football. 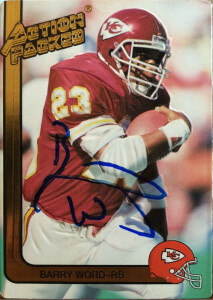 With Barry’s comeback complete, he’d play for Kansas City in 1991 and 1992. He’d be an excellent insurance policy for Okoye in the meantime. In 1993, Barry was traded to the Vikings. He’d start 8 games for Minnesota, rushing for 458 yards and 2 TDs on 142 carries. 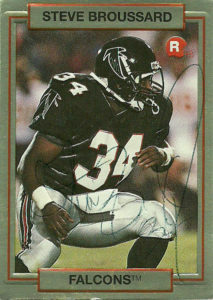 Word then signed with the Arizona Cardinals for the ’94 season, but did not see any action. He’d retire and has been a difficult find through the mail. I decided to do a paid signing for the enigmatic back through the Philadelphia Connection. The price was so reasonable I was able to get 5 cards signed by him. 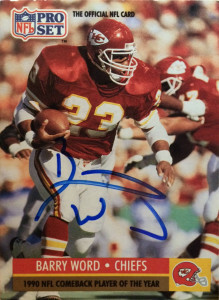 Not to look a gift horse in the mouth, but Barry Word’s autograph is one of the worst I’ve seen in a while. It’s up there with George Zimmer from Men’s Wearhouse with just the ‘B’ and the ‘W’ being legible. The rest is well- there at least. Some great cards however of Barry graced his short lived career. Of them the ProSet 1990 is quite dynamic, and briefly during the short lived heyday of the card boom, along with its Score counterpart were valuable cards. It’s a shame that speculation and over production killed the market so badly its never completely recovered. 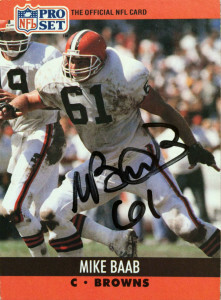 Mike Baab was a fixture at center for the Cleveland Browns after being selected in the 5th round of the 1982 draft. He is remembered perhaps most strangely for a film that he put together with his Browns teammates called “Masters of the Gridiron”, which was not only inspired by the Chicago Bears Super Bowl Shuffle, but also He-Man and the Masters of the Universe, and the section of the crowd at the stadium that called themselves Baab’s Barbarians. 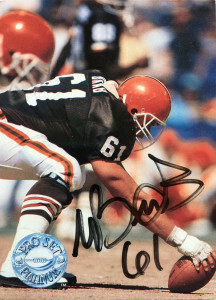 Mike played with the franchise through the 1987 season where he became a leader in and out of the locker room. 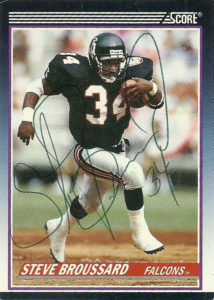 He then was unceremoniously traded to the New England Patriots one week before the regular season was to began in 1988. (Apparently head coach Marty Schottenheimer wanted to start Gregg Rakoczy at center and Mike did not want to be a backup.) The move so angered Baab that he stormed out of the team facilities and players began to openly dissent- most namely starting quarterback Bernie Kosar who criticized the move. 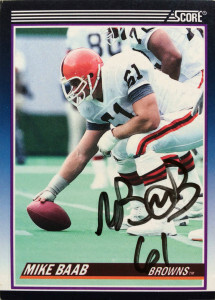 While Baab toiled away in New England in 1989 and 1990 (which back then amounted to a Siberian prison camp) starting 28 of 32 games, the Browns offensive line suffered and the quarterbacks took a vicious pounding. 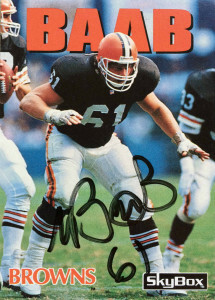 Suprisingly he was left unprotected by the Patriots following the 1990 season, so Baab put his feelers out about returning back to the place he called home for most of his football career: Cleveland. 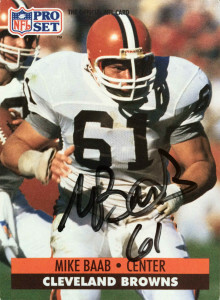 Mike returned to Cleveland and anchored the Browns line through the 1991 season. He’d be lured to Kansas City for one final season before finally putting up his cleats and moving back to Central Texas. Mike was inducted into the Longhorn Athletics Football Hall of Honor in 2008. 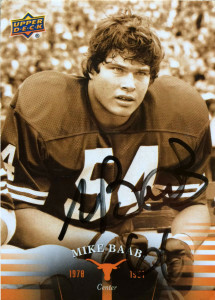 A letterman at Texas from 1978 to 1981, Baab was voted team captain for the Longhorns as a senior. That year, he helped Texas post a 10-1-1 record, including a 14-12 upset of then-No. 3 Alabama in the Cotton Bowl, en route to second-team All-America honors. There were so many good past and present cards of Mike, I did abuse this one slightly. Baab was kind enough to sign these cards for me, albeit after a long wait. Some real solid cards of here of Mike. I think my favorite of this group is the Skybox entry. The framing element that they use with the last name, really gave these cards a nice poster effect. At the time I was surprised that these cards didn’t get more traction in the market because they were very cutting edge. I have a soft spot for the ProSet 1991 card. It’s got a nice rough close up of Baab backing up and demonstrating some sleight of hand technique while his pad rolls up his hand. These cards pretty much encapsulated the height of my collecting days and the rebirth of it with the Upper Deck UT 2010 entry.